Adobo is a dish that originated in the Philippines. It was invented during the time when there was no refrigerator yet. Food is easy to spoil in a tropical country and Adobo is one dish that lasts for days even without refrigeration. 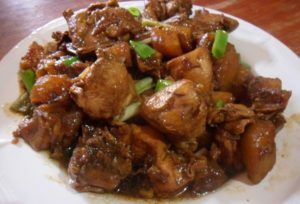 Considered the flagship dish of the country, Adobo is also getting to be noted in some parts of the world particularly in US where there are many Filipino residents. The main ingredient of Adobo is pork or chicken and it can also be a mix of both pork and chicken. The exotic taste of Adobo is the crunchy pork or crispy chicken. Slice the pork in 2-inch cubes. It is better if the rind is intact because it will provide the crunchy texture. For the chicken, cut the parts according to your desired size. Crush the garlic and place in a pot together with the soy sauce and vinegar. Let it boil before adding 1 cup of water. You can also add the red pepper at this time. Upon boiling again, add the pork. If it is a mix, add the pork first and then add the chicken after 5 minutes of boiling. After another 5 minutes, turn off the fire. That means you have boiled the pork for 10 minutes and the chicken for 5 minutes in the mixture. Use a non-stick frying pan to avoid the usual problem of the meat sticking on the pan. You will notice the oil that is floating on the broth. Get that oil and use it to fry the meat. Pork first, cover the pan to avoid the rampaging oil. Fry the pork until it turns brown and the rind becomes crunchy. If your Adobo is a mix of pork and chicken, fry the chicken after removing the pork from the pan. Fry until the chicken becomes brown. After frying the pork and chicken, put back everything into the pot and boil for a few seconds so the broth will penetrate the meat. Turn off the fire and the Adobo is ready for serving. For the side dish, boiled vegetables dipped in soy sauce is a good match for Adobo. It can be cabbage, broccoli, or eggplant (aubergine). Also good for boiling are tropical vegetables like okra, water spinach, or young sweet potato leaves. And for a more flavorful meal, Adobo is best eaten with Adobo rice instead of plain steamed rice or bread. Fry some crushed garlic using the oil of the cooked Adobo. When the garlic turns brown, add the cooked rice and stir for 5 minutes. There you go, enjoy your Adobo.